Sharing another card for you today that features the CottageCutz Owl. This little fellow is not only extremely cute but he is also versatile. Thought it would be fun to make a witch's hat and use him for a Halloween card. He is roosting on a felt spider's web. :) This die is in several pieces but is SO easy to put together. 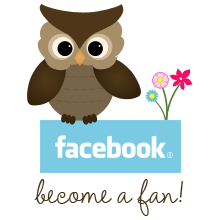 You can have your owl creation finished in a few minutes. :) Be sure to check out all the great CottageCutz dies at Scrapping Cottage. 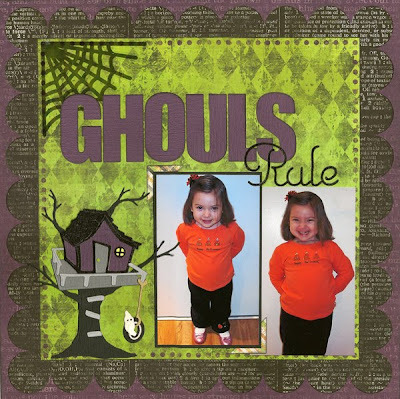 I have to say that this CottageCutz Halloween release has got to be my favorite so far. This CottageCutz Pumpkins Stacked die was so simple to put together and I love the detail. 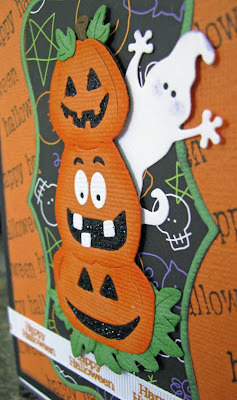 This 2x2 ghost die is a must have because he can be added to just about any Halloween card or layout and he's so cute and simple. I just cut him out of white and then put a tiny piece of black behind the eyes and have him some cheeks and he's done. I love how the background, foreground, leaves, eyes, teeth and stem are all so you can do all your cuts once and not have to run it through your machine over and over again to get all your leaves etc. It's not even October yet so be sure to order your Halloween CottageCutz dies so you can use these great dies all month long! Today's project features the CottageCutz Owl on a birthday card. Since this is a birthday card, I wanted it to be bright and festive. I used two different shades of pink for the owl. Whooooo says owls have to be brown? 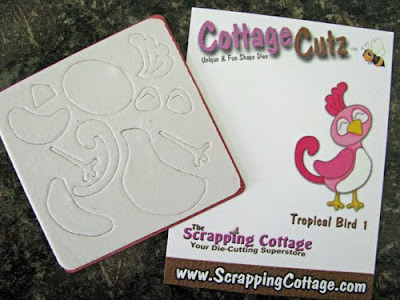 :) Be sure to check out all the great CottageCutz dies and other products at Scrapping Cottage. haunting the Scrapping Cottage tonight! remember the fun they had trick or treating! Fun with the new Halloween Dies!! As soon as my new Halloween Cottage Cutz dies arrived in my mailbox, I couldn't wait to get them open so I could start playing!! I just LOVE Halloween products! Every year they just keep getting cuter and cuter and this year is no exception. Something I always enjoy is figuring out how to re-purpose my dies so that I am able to get more use out of them. As soon as I saw the Halloween Cottage Cutz release, I immediately identified several dies that would look GREAT on some Disney layouts! I thought the Cottage Cutz Candelabra would make a great and maybe unexpected addition to a Disney Haunted Mansion page! Remember during the ride where you see the floating candelabra?! I also used my silhouette to cut out my title from the font Old English which is equivalent to the QK Haunted alpha. I wanted to make sure that my layout looked spooky without looking Halloweeny. 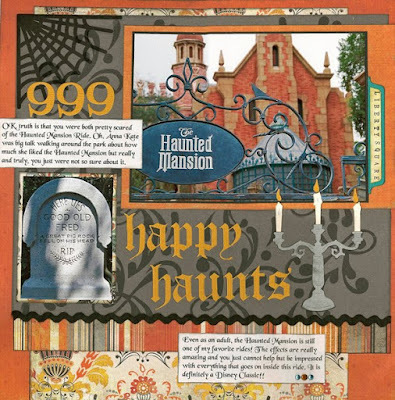 Be sure to check back later for my second page - lets just say, you might see the Cottage Cutz Haunted House because what would a Haunted Mansion layout be without a haunted mansion embellishment!! 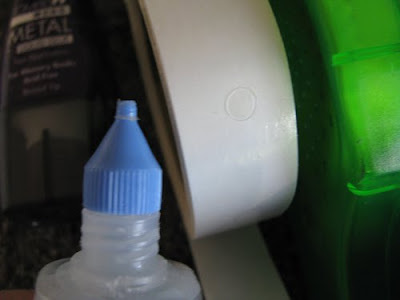 Today I wanted to talk about adhesives. I'm always asked "what is your favorite kind of adhesive?" My answer is that there is no one adhesive that is great for everything. 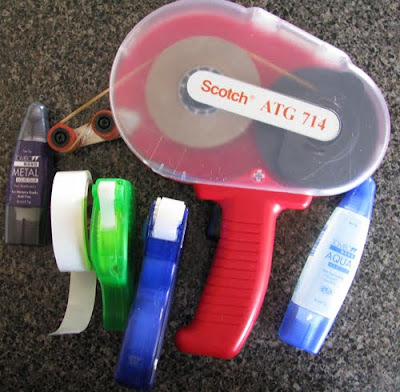 Scotch ATG714 - This is a big adhesive gun but you know what? 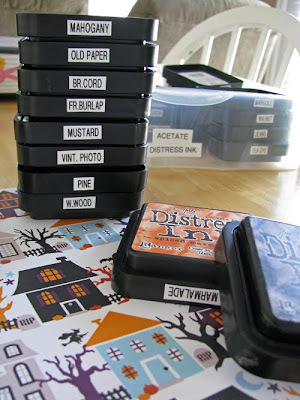 It's easy to use and I love how it applies adhesive quickly and easy and hold larger rolls of adhesive. You can get regular or acid-free refills. I use this for adhering my photos to cardstock and all of my bigger jobs. The Glue Glider Pro is very similar, but came out after I bought my Scotch ATG. This gun is cheaper but the refills are a bit more expensive. The next adhesive is my Hermafix dispensers. One is the square tabs and the other is tiny dots. These are great for adhering the medium to small items that the ATG is too big for. I also like to cut the squares and apply them to larger letters etc. 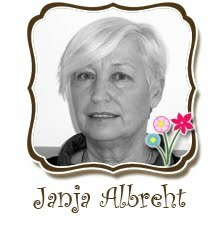 Then there is Glue Dots - these are great for buttons, flowers, ribbons, gems and trinkets. They stick super well and are tiny enough for all your little objects. The last two are the Tombow Mono Adhesives. The purple label is great for metal objects. 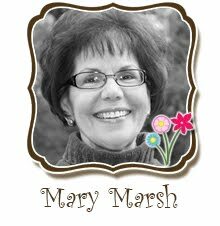 I use this on the back side of ribbon, metallic cardstock and findings. The blue label is a life-saver for my diecuts. It has two tips and I always use the small tip as pictured below. 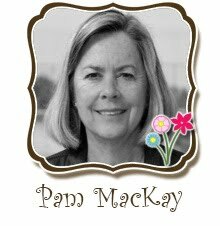 This is great for applying diecut letters & putting diecuts together. I use this glue every time I scrap and wouldn't ever want to be without it. It dries clear and lasts for a long time. The only time I ever have problems with this clogging is if I've left the cap off for a long time. If this happens I simply stick a pin down there and it clears out quickly. Close up of Tombow Mono Adhesive and Glue Dots. The adhesives I've shown above are very similar to other products on the market, these just happen to be the ones I've used and like the best. I take ease of use and cost when I consider an adhesive. I don't recommend glue sticks because they lose their stickiness after a few years and then your projects start falling apart. I avoid them completely from experience. I love Halloween! 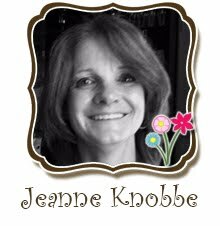 It's such a fun time of the year for parties, decorations, crafts and fun food. 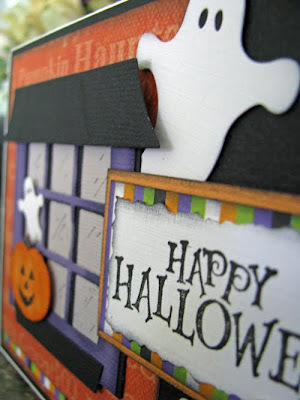 I took the CottageCutz Window w/canopy and transformed it into a Halloween window for my card. I cut out my window in black and purple and layered them for dimension. I shaded around the purple layer. I backed it with some gray cardstock and added some little window markings with my black Zig pen. I also used the pumpkin from the Quickutz Cornacopia die and the ghost die. The little ghost is from the Treat bag die. It's the time of year to start thinking about Halloween, Thanksgiving and Christmas. the Sizzix products at Scrapping Cottage. New Autumn Cottage Cutz Dies!!!!!!! The latest release of Cottage Cutz Dies is now available for pre-order!!! Don't miss out on your chance to save up to 25% with introductory pricing good through Sept 28th!! 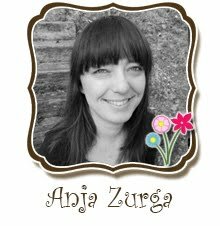 Plus, with any order from the new Autumn Cottage Cutz dies, you get your choice of one of the adorable new Cottage Cutz Autumn Minis! Don't delay!! It has been a little while since I last posted a project to the Cottage Blog, and I am very excited to be able to share my work with you all once again. Today I would like to share a 12x12 page layout I did of my son Jacob playing in our back yard. He just loves this Trike his daddy bought him at a garage sale a few months ago, and would love it even more If only his little legs would actually reach the peddles. and the larger letters are from the QUICKUTZ BLOSSOM GRAND ALPHABET. Spooky, Kooky, Creepy, and Fun!! jack-o-lanterns, haunted houses, and bats! CottageCutz and some fun QuicKutz shapes. 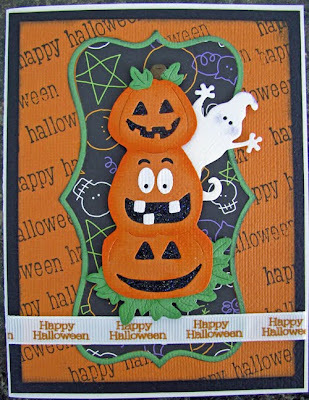 Ever since The Scrapping Cottage previewed the Sept. Halloween Cottage Cutz release, I have been chopping at the bit to get my hands on these adorable Halloween dies!! Finally, I just couldn't wait any longer to make a Halloween layout. (I know, it is only Sept - what can I say - I love scrapping Halloween pics!!!) So, as I was thumbing through my Cottage Cutz dies looking for some inspiration, it hit me - how about a Haunted Tree House!! So I went about turning the already adorable Tree House Cottage Cutz die into a spooky Haunted Tree House. I had so much fun putting this tree house together! And everything you see came from the Tree House die except the little ghost swinging on the tire swing. He comes with the Haunted House die from the Sept Halloween release. It is hard to tell, but I actually painted my little ghost with glow-in-the-dark paint! I can't wait to see if it really works!! 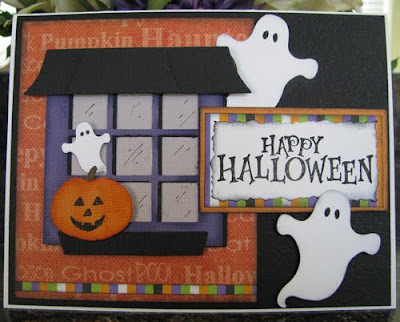 If you haven't already purchased your Cottage Cutz Halloween dies yet, you had better get your order in fast!! Well over half of the first shipment has already sold out so you want to be sure to get your name on the waiting list for the second round!! little, and ran it through my machine. scraps of the tissue paper and crumpled them up. how I used this little guy!! Anyone Having a Bird-day today? 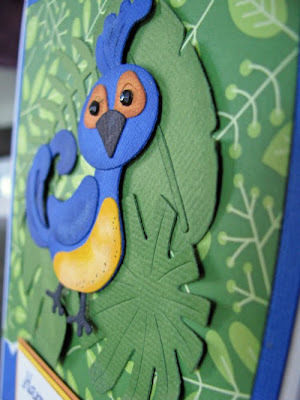 Today's card is made from the CottageCutz Tropical Bird #1 which is a 3x3 die. 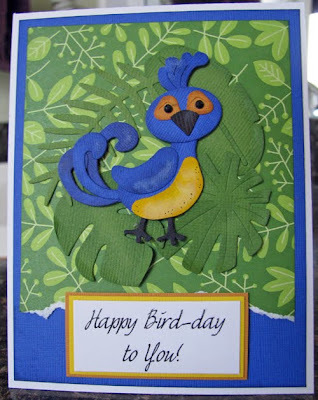 I really wanted to create a card with this cute bird that you could give a guy. I Googled tropical birds and was amazed at how many different colors real tropical birds come in. I found one that was this gorgeous blue and tried to copy it. I added 2 extra tail feathers and some gems for the eyes to give him a different look than the sample picture on the die. Remember to think outside the box when it comes to using your dies. I placed some mounting tape on a few tropical leaves to give him some dimension. I'm anxious to make a girly card next with this cute little bird. some circle punches for the "snowballs." Just think of all the fun things you could do with the CottageCutz Penquin! :) Be sure to check out all the great CottageCutz dies at Scrapping Cottage. CottageCutz bloom wherever they are planted! For all those that pre-ordered the awesome Halloween CottageCutz dies they are starting to ship! As soon as Scrapping Cottage released this Exclusive Tea Set Die, I snatched it right up. I just knew there were going to be so many opportunities to use all the different parts of this die in my future scrapping. 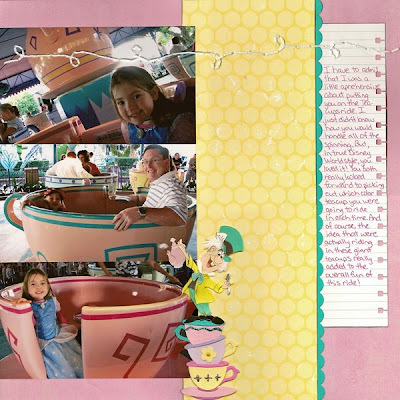 Princess tea parties...heritage layouts...wedding showers...the list goes on!! 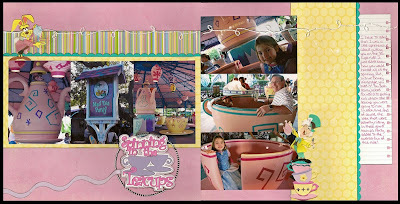 When I started working on my Disney World pictures of the Tea Cups ride, I immediately thought of using this Tea Set. 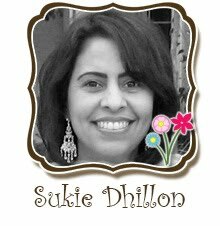 I don't use a lot of stickers because I like to be able to coordinate my die cut embellishments to my pictures and papers. However, I have purchased some of the Disney character stickers and so forth for my Disney pages. 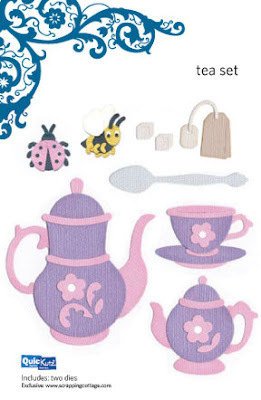 But the teacups sticker that came with the Mad Hatter package of Disney stickers was cute but way too small for a layout. So, by using the cup and saucer from the Tea Set die, I was able to recreate the stacked cups sticker in a much larger and perfectly color-coordinated form. 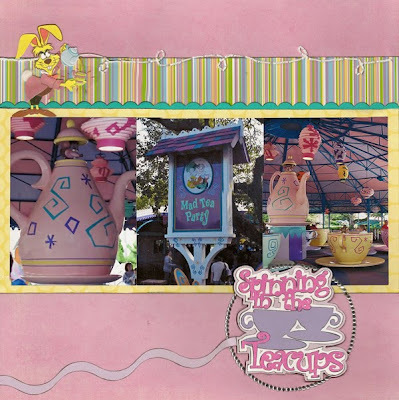 I also used my Silhouette to cut the Spinning in the Teacups title as well as one of the 12" Wave Borders to create the spinning trail coming off of the title. 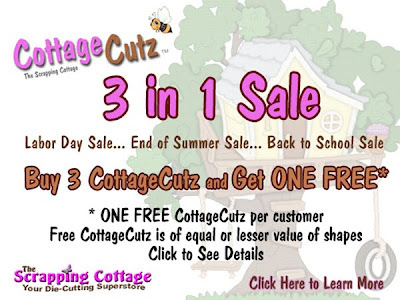 Last Day for Cottage Cutz Special Sale!!! I created this ink chart a few years ago and I am amazed at how often I reach for this. 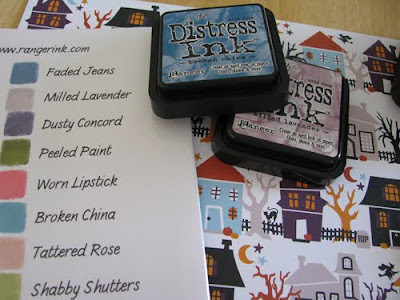 I have one for all my inks, but today I'm just going to show you the one for my Distress Inks. 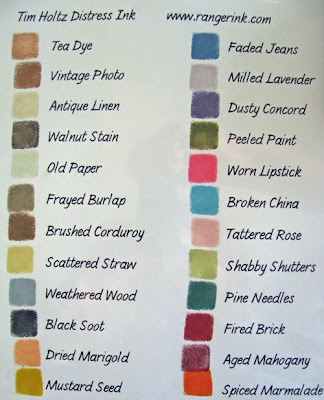 I simply type up a list of the colors I have (or plan on getting) and then stamp the color right next to it's name for easy reference. I do a lot of shading on my patterned papers and diecuts and like to match the color as close as I can. I just place the ink chart up to my paper and see what color or colors match the best. I have found that the color on the pad or the top of the box isn't always an accurate match to the actual stamped color. I also like to label my distress inks so I can easily see what color I'm reaching for. I always store them upside down too to keep the ink at the surface. The moment I saw this die I knew what I wanted to do with it. 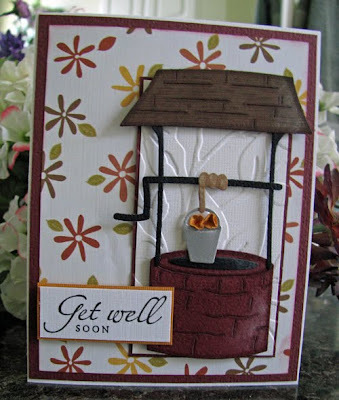 This is the perfect die to make Get Well & Best Wishes cards with. For this card I cut out my pieces from cardstock and then used my Copic Caio markers to color them. I used a darker brown to outline the marks in the wooden roof and made some of my own details, then colored the whole piece with a lighter brown. For the brick part of the well I used a Copic to outline and then applied a little white ink shading to the side. I wanted some flowers in my pail so I punched out two circles and shaped them to look like flowers. I wanted the well to stand out a bit so I mounted it with mounting tape on top of a cardstock panel I ran through my Cuttlebug with an embossing folder. We're HALF Way There and a Red Hibiscus!